What is “Onyx”? Visit us at VMworld and get a chance to find out. Do you enjoy reading huge piles of API documentation? Do you use wireshark to reverse-engineer wire protocols? Do you like using strace to figure out what the heck a program is doing? Me neither, which is why I’m really excited about a little project we’ve been working on called “Project Onyx”. What exactly is Onyx? Quite simply, Onyx converts mouse clicks into PowerCLI scripts. Sort of like Excel’s macro record, except it’s for vSphere and doesn’t come with a stupid paper clip. Does this sound like a tool you could use? We’re looking for a handful of dedicated people with a burning need for automation to help us get Onyx really solid. I would probably describe the tool as somewhere between alpha and pre-alpha and it’s a bit hard to set up at the moment, so we need people who are dedicated enough to work through the tough initial phases. Still it really is worth it. I’ve been working with vSphere API for about 3 years now and even I learned a lot by just toying around with Onyx. So if you want to give Onyx a spin, here’s the deal. Come by session VM2241 at VMworld next week, and bring your business card. During the session we’ll be showing how to take scripts that Onyx generates and turn them into reusable bits of PowerShell code, that can be used in the pipeline with all the PowerCLI commands you know and love. There are two sessions, one on Tuesday at Noon and one on Tuesday at 5:30. Give us your card and we’ll pick 5 names from each session and give you first dibs on the raw power of Onyx. Enjoy the teaser video and hope to see you next week. This entry was posted in Uncategorized on August 28, 2009 by Carter Shanklin. VMworld 2009: PowerCLI and PowerShell roundup. There’s a lot of stuff related to PowerCLI and PowerShell going on at VMworld, so it really deserves a summary of everything. It’s not enough to rename the event to PowerCLIWorld 2009 (maybe next year) but it’s still a pretty big list. Each of the sessions below either talks about PowerCLI directly and in depth, or introduces a new PowerShell tool. So if you’re looking to get more automated, scale out your existing environment, or just save a lot of time, be sure to check all these sessions out. Visit vmworld.com to add them to your schedule. This entry was posted in Uncategorized on August 20, 2009 by Carter Shanklin. How to list datastores and VMs that are on shared storage. A lot of the magic VMware provides relies on shared storage. If a VM is on local storage, you can’t VMotion it, HA won’t restart it, and a host of other limitations. Do you know which of your VMs, if any, are on local storage? This script can make answering that question pretty easy. First, here’s a function that will locate datastores that use shared storage. And you’ll wind up with a list of datastores that your hosts can share. Once we have $localOnly, we pass that to Get-VM. This gives us the list of VMs that can’t be shared amongst hosts. This entry was posted in Uncategorized on August 13, 2009 by Carter Shanklin. Trying to dig into PowerCLI but don’t know PowerShell? Start here. yet. If you’re getting started, here are my recommendations. PowerShell and are ready to run some commands. First, if you’re an absolute beginner, start by mastering PowerShell help. you should also check out MSDN. principles with a few cmdlets of your own, you won’t regret it. The top 25 cmdlets worth knowing. of PowerShell code over at poshcode.org. So here are the top 25 cmdlets used by code over at This sample is drawn from a lot of different authors all trying to accomplish different goals, so it's a good cross section of the most useful cmdlets. Note however that I would recommend that beginners not learn add-member until later, even though it is obviously a very useful cmdlet for experts. expert to really dig in to it. (you should skip add-member until you’ve become a master in your own right). Operators and other language features. for reference, our trusty vertical friend appears 15491 times. 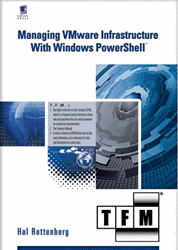 while Hal’s book lets you learn while you improve the way you manage VMware. This entry was posted in Uncategorized on August 10, 2009 by Carter Shanklin.